The idea that you could even influence the game is ridiculous. Judging people is very similar to that. Although that doesn't explain why we judge it helps a little explaining our people over people. Easier said than done I'm sure. To stop judging people you need to understand a fundamental truth. Everyone judges everyone. Weather you think so or not. Judging someone is just part of our make up. No one is impartial. The danger of judging is our actions after the fact. So think about this. Every time you interact with a person. Every time you answer a persons questions. The person on the other side is going to judge you. It may be good or it may be bad. But at the end of the that interaction. A small judgment is going to take place. 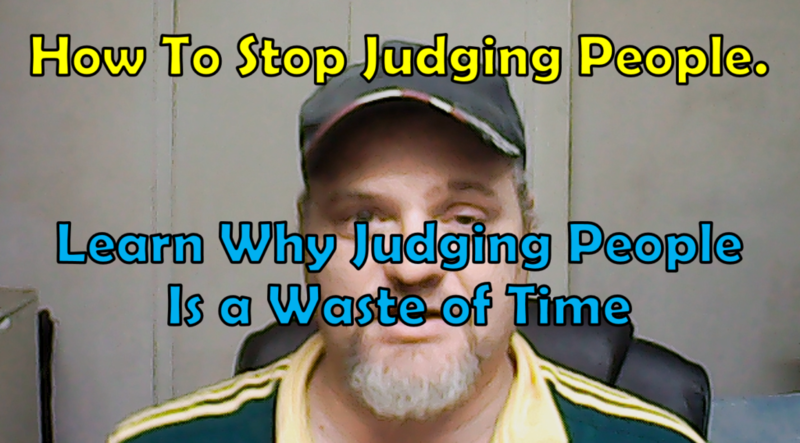 So lets not misunderstand that I'm NOT talking about STOPPING JUDGMENT. I'm going to show you how to deal with your assessment of a person and then why you NOT react in a unhelpful, ridiculous way. We all make judgments, YES all of us. It is as I said part of your make up. What we need to do is find a way to control our base instincts. Especially when its harmful to ourselves, and others. Think about when you get angry at someone and then hours later you come to your senses and think that you could have handled it better. Sometimes we hold on to our anger and it burns us inside and out. What we are doing is really creating a prison for our minds and we lock in our happiness. No one gets to see it. People just see an empty, angry person who is mad at the world. The truth is YOU have control over your Judgment of people. The only person who can stop it is YOU. No one else! 90% of our problems can be solved by us. The rest the remaining 10% are things we have no control over. We spend so much time trying to solve the stuff we can't can't. So start solving the problems. Realizing that our bad judgements of people is in our hands. And yes! its in that 90%. At the end of the day Judging a person and making assumptions about people is a total waste of time.